U.S. stocks closed little changed Wednesday, as investors took in new housing data and another batch of corporate earnings. The Dow Jones Industrial Average bounced along the breakeven, while the Nasdaq and the S&P 500 edged slightly higher. Of the 30 stocks listed on the Dow, 24 traded higher, but IBM (IBM) dragged the index down. The tech giant, which has a heavier weighting on the Dow, reported a dip in sales after the markets closed Tuesday, sending the company's shares plummeting 5%. "The most important thing we're looking at is earnings, and so far, so good, but we're not ringing the bell yet," said Doug Cote, chief market strategist at ING Investment Management. "But we're also really encouraged by what looks like a true housing recovery, which is important to the consumer and bodes well for corporate profits." Housing starts, which tally the number of new homes under construction, climbed 15% to an annual rate of 872,000 in September, according to the Census Bureau. That's the highest level in more than four years and better than what economists had expected. Building permits for future construction also rose to the highest level in more than four years. Of the 37 S&P 500 companies that have reported third-quarter earnings, 23 have beat analysts' estimates, according to S&P Capital IQ. But they still forecast that overall S&P 500 earnings will decline 0.7% -- the slowest growth in three years. Early Wednesday, Bank of America (BAC) reported third-quarter earnings that beat forecasts, citing improved lending and deposits. JPMorgan (JPM), Citigroup (C), Goldman Sachs (GS) and Wells Fargo (WFC) have also all topped expectations. But not all corporate news was good news. 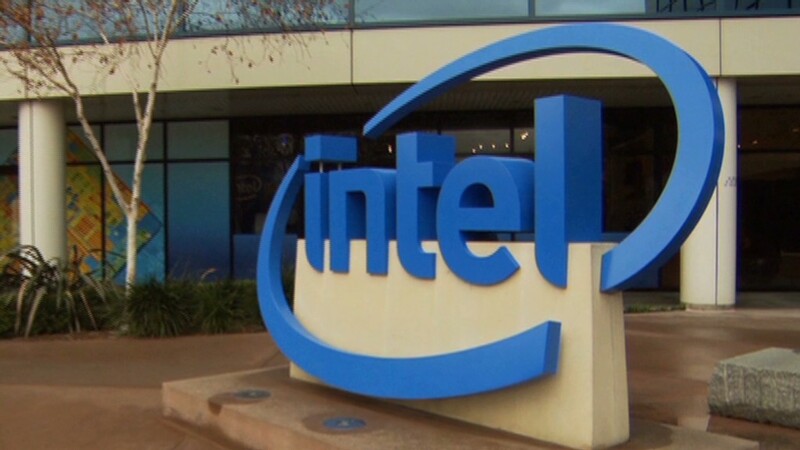 Intel (INTC) reported lower profits and sales after the close Tuesday, weighed down by weak PC sales. Shares fell nearly 3%. Apollo Group (APOL), owner of the nation's largest for-profit college, tumbled 22% Wednesday. The company reported an 11% drop in fourth-quarter revenue on Tuesday, and said it would cut roughly 800 jobs and close 25 campuses. Results from American Express (AXP) are due after the close. World Markets: European stocks closed higher Wednesday. Britain's FTSE 100 gained 0.7%, the DAX in Germany rose 0.3% and France's CAC 40 added 0.8%. Meanwhile, Spanish bonds climbed after Moody's Investors Service affirmed Spain's investment grade credit rating. Asian markets closed higher. The Shanghai Composite gained 0.3%, the Hang Seng in Hong Kong climbed 1%, and Japan's Nikkei jumped 1.2%. Related: Can presidents change gas prices? Currencies and commodities: The dollar slipped against the euro, the British pound and the Japanese yen. Oil for November delivery fell cents 20 cents to $91.89 a barrel. Gold futures for December delivery gained $6.70 to $1,753 an ounce. 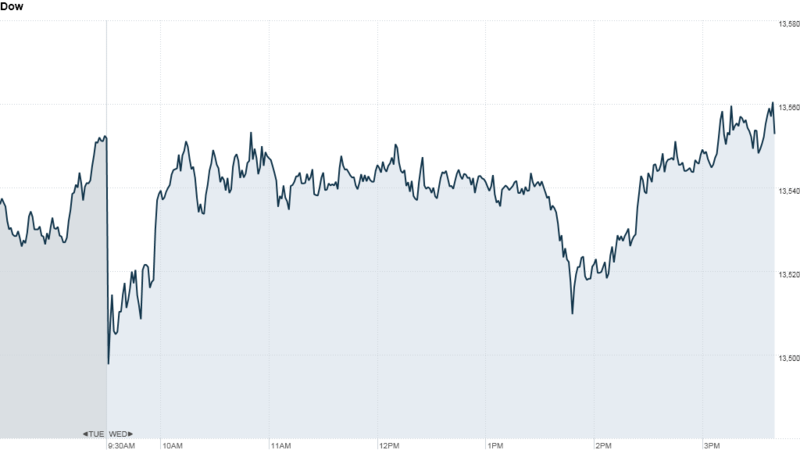 Bonds: The price on the benchmark 10-year U.S. Treasury fell, pushing the yield up to 1.80% from 1.72% late Tuesday.